An estimated 24.8 million miles of roads crisscross the earth’s surface connecting people and cultures and civilizations. The large majority are the so-called flexible pavements, made from asphalt. This means that hundreds of millions of barrels of oil have been used for that development. These road surfaces are comprised of around 90 percent rock, sand, and limestone, with 10 percent bitumen. Bitumen is the material used to bind these roads together and is extracted from crude oil and sold by oil companies. Meanwhile, the earth is facing a global plastic pollution problem. Globally, only 14% of plastic packaging is collected for recycling, while most plastic packaging is used only once. Over 8 million tonnes of plastics finds its way into the ocean each year. People around the world purchase one million plastic bottles a minute, and more than 100 billion disposable coffee cups are sold globally every year, yet hardly any are recycled. There are around five trillion pieces of plastic in the ocean. All this waste plastic is a major cause of land and sea pollution resulting in clogged waterways, flooding and endangering marine life. It is no wonder therefore that many around the world are working towards finding solution to this urgent problem. One of them is in building plastic roads. From India to the UK and Ghana, stories abound of ground-breaking and innovative practices of building these plastic roads. India produces about 15,000 tonnes of plastic waste daily, of which about 9,000 tonnes is recycled. The remainder clutters landfills and clogs drains, and is blamed for urban flooding. 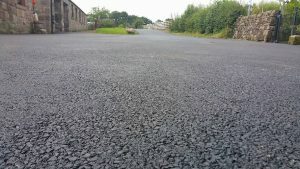 The country currently boasts of over 100,000km of roads built using the innovative and home-grown techniques in building plastic roads. Plastic waste are collected and sorted. Thereafter, they are cleaned, dried and shredded. This shredded plastic is mixed and melted at around 170°C. Hot bitumen is then added and mixed with the melted plastic. The mixture is then laid like regular asphalt concrete. India has built over 100,000km of plastic roads. In 2002, an Indian Professor of Chemistry – Rajagopalan Vasudevan developed a technology that uses finely-shredded plastic waste that is added to heated bitumen. This mix is poured over stones. The plastic waste used can include anything from sweet wrappers to shopping bags. This mix cuts the quantity of bitumen required by around 10 per cent. Each kilometer of a single-lane tar road can consume one tonne of plastic waste, and the plastic can double or even triple the life of the road. India also hosts the world’s second-largest road network and one of the highest numbers of road accidents globally. 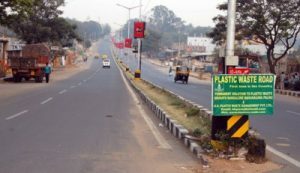 In 2015, the Indian government made it mandatory to use waste plastic in building most highways and has announced an investment of 6.9 trillion rupees ($11 billion) to build 83,677km (52,000 miles) of roads over the next five years. 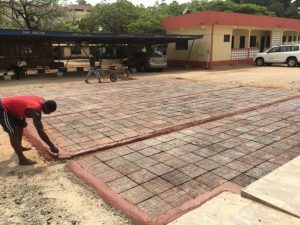 A company in Ghana Nelplast Ghana Limited, is turning plastic bags and all other kinds of plastic garbage into pavement blocks that can be used to build roads. The company shreds the bags and mixes them with sand to create a new form of asphalt. 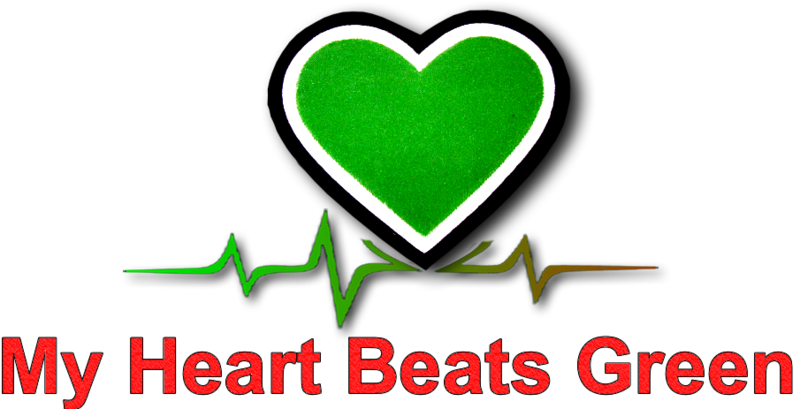 This asphalt requires fewer natural resources to create, is more resilient and lasts a long time. Ghana produces 22,000 tonnes plastic waste annually according to Trashy Bags, out of which the country recycles only 2%, with the remaining 98% usually dumped on land fields. The country has banned plastic bags as part of efforts to combat the escalating problem of plastic pollution. Ghana is building roads from waste plastic bags. Nelplast is run by Ghanian network engineer Nelson Boateng who developed the style of asphalt, which comprises of 60 percent plastic and 40 percent sand. He also created his own recycling machine using scrap metal, electrical wires and motors, and started the company to recycle around 4,400 pounds of plastic junk. The company also sells plastic roofing tiles and its objectives include recycling “about 70 percent of plastics waste generated by the country daily into useful products that can be used for a lifetime.” Nelplast offers direct and indirect employment to over 230 people. A UK Engineer Toby McCartney came up with a solution to help tackle the waste of natural resources and the growing plastic pollution problem. 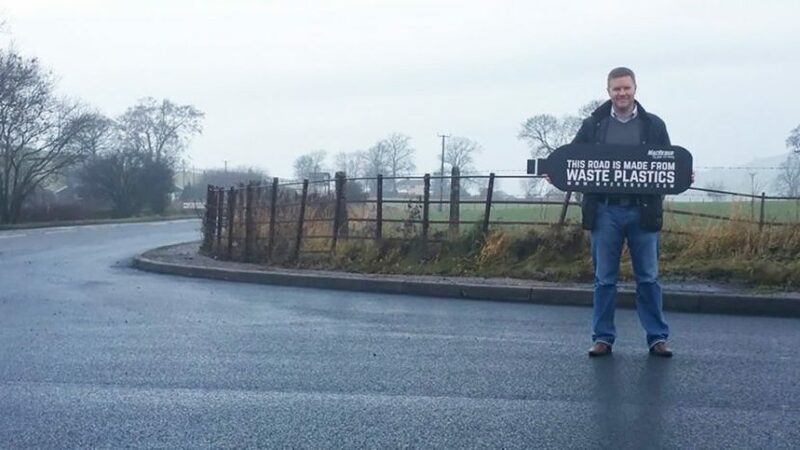 His company, Scotland-based MacRebur, lays roads that are as much as 60 percent stronger than regular asphalt roads and last around 10 times longer – and they’re made with recycled plastic. Plastic roads are cheaper, ecofriendly and longer lasting. He turns 100 percent recycled plastic into what he calls MR6 pellets, or small pellets of waste plastic, which replace bitumen, the material used to bind roads together. At asphalt plants the MR6 pellets are then mixed with quarried rock and a bit of bitumen. McCartney was inspired to design plastic roads after his daughter’s teacher asked the class what lives in the ocean, and his daughter said, “Plastics.” He didn’t want her to grow up in a world where that was true. He had also spent time in India, where he saw locals fixing holes in the road by putting waste plastic into the holes and then burning it. VolkerWessels, a construction services firm based in Holland also plans to roll out plastic roads. Their idea involves recycling plastic waste into lightweight, prefabricated modules with hollow interiors that can be fitted with cables and plastic pipes to allow excess water to drain. These pre-fabricated units will be easy to transport, assemble and maintain, and of lighter weight. This also implies that the ground will be less prone to subsidence. The firm believes that due to its light weight and modular installation, the roads could be built to last three times longer. They could last about three times as long as conventional road structures, according to new research. Plastic can make roads more durable against extreme weather — floods and extreme heat. Reduces the amount of plastic waste that ends up in a landfill. The future is here; and the future is plastic roads. So, Why Aren’t We All Building Plastic Roads?